We’ve all heard the warnings about the dangerous rays of the sun, and now that summer is here, we need to put that information to good use and protect ourselves. The UV radiation of the sun can be detrimental to the condition of skin and hair (especially hair that is chemically treated or colored). For that reason we must do what we can to protect our skin and hair from both long-term and short-term damage. The common cause of summer hair damage is chlorine. Chlorine strips the hair of natural oils, swells the hair shaft and raises the cuticle layer leaving the hair more porous. It can cause breakage and split ends, and can distort the color of the hair. This is especially true of hair that is chemically-colored. However, sunlight is also a damage-dealer to the hair. The sun’s rays can burn hair just as readily as it burns the skin. The UVA and UVB radiation in sunlight can damage the hair cells, weakening it and reducing its strength and elasticity. The UV radiation can also disperse the pigment in the hair (natural or chemically-applied) and lighten and fade the hair’s color. In the short term, the sun’s damage is readily seen (and more-readily felt) as sunburn. The UVB radiation causes burns in exposed skin, affecting the fairer and less naturally-pigmented more severely. The burns can range from irritating and mild to very severe in cases of long exposure. Be especially careful in pools and in windy locales as these cooling factors can mask the damage you are getting from the sun. More long-term damage is done by the sun inside the skin as the UVA radiation weakens the collagen and elastin of the skin, making it less plump and less resilient. There’s also the development of melanomas – from freckles, which can be annoying - to more serious tumors – which can have life-threatening effects. Combat pollutants, chlorine and salt water residue by using clarifying shampoos and a good conditioner after swimming or a day at the amusement parks or beach. Because both sun exposure and swimming can result in your hair being more porous, use a protein-rich conditioner to help soothe the hair’s cuticle layer and protect it from further damage. A light, leave-in conditioner with a sunscreen ingredient is also a great way to stop sun damage to the hair before it starts. Look for products containing ingredients like: oxybenzone, titanium dioxide, and benzophenone-3. These will keep your crowning glory glorious. Remember that each strand of the hair is made of a protein called keratin, and has three layers. The medulla - the thin, innermost layer of cells (hair that is very fine may lack this layer); the cortex – the middle layer (which accounts for 90 percent of the hair’s weight and contains the pigments that give the hair color); and the cuticle – the outer layer (consisting of overlapping scales of protein to protect the internal fibers and help retain moisture). 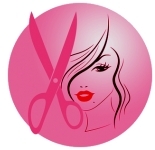 In healthy hair the cuticle layer lies flat, giving hair a shiny, smooth appearance. Wearing a hat or visor is one of the most important tips for summer days. 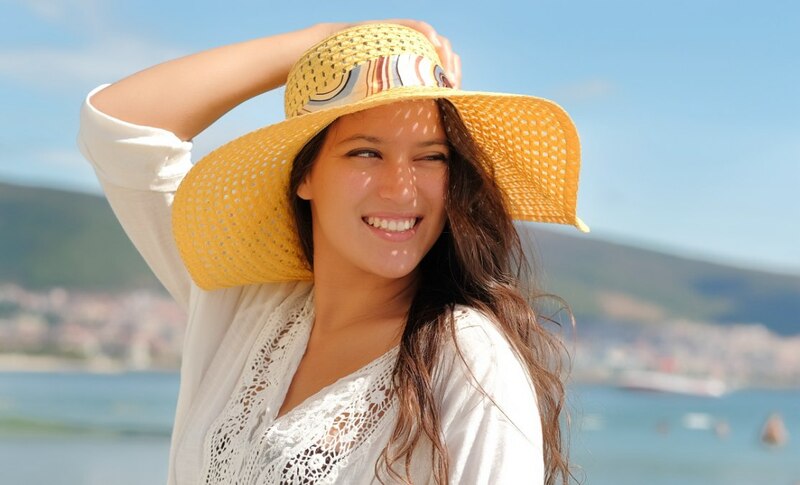 Whether you’re at the beach, poolside or playing in a city park, not only does the hat protect your face from harmful rays, but it protects your scalp as well. With the wide variety of styles and types of headwear available, there’s no reason you can’t look good, and be sun-safe. Another summer necessity is sunscreen – specifically one with an SPF of 30 or higher. Regardless of your skin tone and complexion, you need sunscreen to combat damage from the sun. Many people mistakenly assume that because they tan easily that they don’t need sunscreen. However, since the damage done by the sun includes internal breakdown of collagen and elastin, which increases the look of aging, sunscreen is for more than preventing burns. Just remember to reapply your sunscreen every few hours, or after getting wet. If you want to have a little color for the summer months, try a sunless tanner. The products available these days allow you to have a range of looks – from a sun-kissed glow to a deep bronze – without risking skin cancer from spending time in a tanning bed or booth. Self-tanners come in sunscreen formulas to allow you to have some color while you spend your time enjoying the sun, and with moisturizers to make them perfect for applying fresh from the shower to keep your skin dewy, soft and golden. One summer must-have for the skin is Water. It is more important than ever during the summer months to keep yourself hydrated. Drinking plenty of water helps your skin look its very best and helps fight the signs of aging. The average person should be drinking at least eight (8) glasses (eight ounces) of water each day. If you are spending all day in the sun, and are engaging in physical activity, swimming, running or playing sports and games, you need even more. Finally, keep a good sunburn care gel or lotion on hand. The best of these products usually includes aloe, which helps to heal the burn, soothe the pain and protects the skin by creating a protective layer over the skin’s surface. Even if you don’t get sunburn, aloe can be a great after-sun moisturizer, which can re-hydrate the skin and leave it feeling refreshed and tingly. Summer is the time when most people plan family outings, vacations and generally make the most of their leisure endeavors. There’s no reason you can’t enjoy these things and still keep your skin and hair looking its very best. Besides, nothing can dampen the joy of a family vacation like one or more people getting sunburned making their skin – and their tempers – very sensitive. These tips can make all the difference in the world.